Finally, in that tongue-tied state that you find yourself in, you’ll also be giving the oral board panel members that icky, awkward interview feeling that we, the panelists HATE! If you don’t hit a home run on that first question your entire score suffers, regardless how well the rest of your interview goes. Your ability to set the pace for your interview depends almost entirely on your willingness to prepare as far in advance for your interview as humanly possible. If you only have a week to get ready for your interview, use it. If you’re starting your last year of school and won’t be applying for departments for another 12 or 18 months, start preparing now. One week or two years, start now! Why am I always preaching preparation? I’ve interviewed so many candidates over the years and among the many observations I’ve made and documented, this one tends to stand out to me when I speak to groups of law enforcement hopefuls. Average and ill prepared. This is the applicant that just kind of wings it. They deliver the worst interview, and these are the majority of applicants. Good talker, but ill prepared. This candidate fares a bit better in the interview, but a bit better than horrible doesn’t cut it. 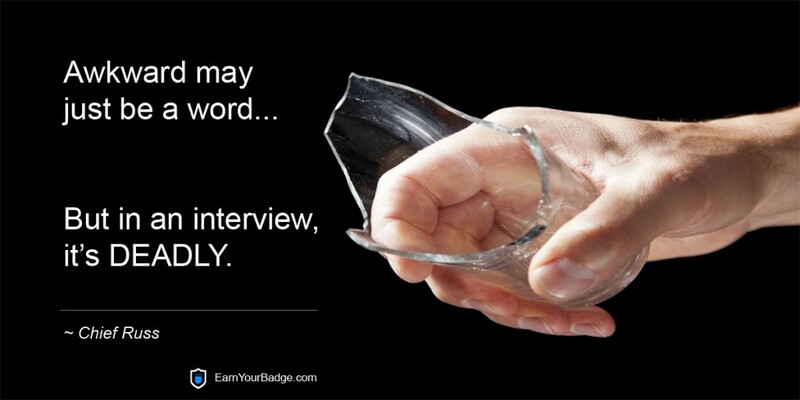 Oddly, it’s the good talker that almost never prepares for an interview. I have no data to back up my assertion it’s just been the reality over my 20 years of conducting interviews. Average but prepared. This is the applicant that wins the interview game every time. They’ve done their homework and they KNOW how to conduct business in the confines of a LAW ENFORCEMENT oral board interview. I capitalized LE in order to differentiate our interview from most any other. This is why I preach preparation for LE interviews. One need not be a great talker in order to wow the oral board panel, just prepared. So, what’s with setting the pace? There’s a lot to setting the pace of your interview, and if you haven’t seen my video titled “Tell Us About Yourself” I strongly suggest you watch it. Here’s the link to my “Tell Us About Yourself” video. I’ll send it to you right after the 7 deadly sins video. Let’s go back to the pub and burger analogy. When you learn to treat your interview more like a conversation than a brain picking session, you’re doing what very, VERY few law enforcement candidates do, and that’s make the panel comfortable with you. When they’re comfortable with you, they’ll like you. When they like you, they’ll do for you what they do for very, VERY few candidates. They’ll offer you a position at their law enforcement agency! Conversational, but not too friendly is a must give, disclaimer. Let them get as friendly as they want, but manage your friendliness at a level that says, I’m comfortable with this group of panelists, but still respectful. There’s a radio show host in my area that often repeats himself over and over and over on air and it drives me nuts. I’m going to do the same thing right now so that if the ONLY thing you leave this blog post with are these last two sentences, your time reading this will have been well spent. Proper preparation for your oral board interview is critical because it really, really, really works. It REALLY does!